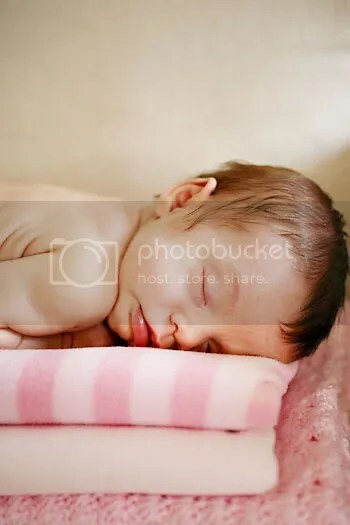 I’m sure you’ve all seen a picture where the subject (let’s just say it’s a baby because as a mom I’d say 90% of my pictures are probably of my babies) is in focus. You can very clearly see the little eyes and mouth peering out at you from the image, but the background is out of focus. That’s the result of something called depth of field, and depth of field is a result of a few things but mainly the distance you are from your subject and your aperture. If more of the image is out of focus we say it has a shallower depth of field. More in focus it’s got a longer depth of field. I already mentioned that the depth of field has to do with your aperture and that the smaller the number (which if you remember means BIGGER opening and more light coming in) the more potential there is for the background of your image to be out of focus, which is what a lot of you are probably going for. Lucky for us this actually works to our advantage. Generally we want to have a fast shutter speed (to keep those little hands and feet in focus and not turn them into a blurry mess) and a wider aperture will not only let us get that “out of focus background” effect we want (which by the way photographers refer to as “bokeh”) but it will also allow us to crank up our shutter speed a little and have a better chance of stopping the motion of our little ones. The other main factor is how far you are from your subject, and how far that subject is from the background you want to be out of focus. generally speaking you want to be closer to your subject than your subject is to the background in order to get the greatest amount of blur. 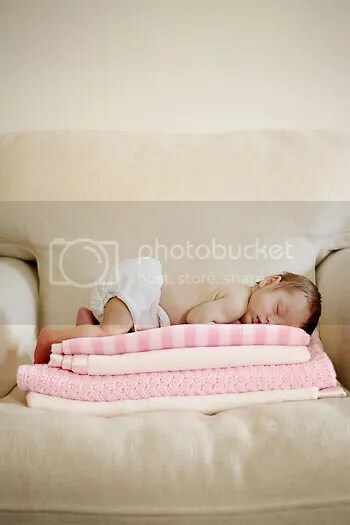 If you are shooting a baby on a couch for instance, chances are the back of the couch is still going to be in focus when you take your picture UNLESS YOU ARE VERY VERY CLOSE TO THE BABY. If your lens is closer to the baby than the baby is to the back of the couch, bingo. Out of focus background. The smaller your f-stop the more blur, and the more you’ll get that fabulous bokeh. Let’s just take a look at a few photos to illustrate the point. Both of these were shot with a 50mm lens. Both at f 2.8 and 1/50th of a second. In the first one I’m much further than from the baby than she is from the back of the couch and you can see the texture of the couch. In the second shot I moved closer (this is not a feature of zooming or cropping, I actually moved myself) and now not only is the back of the couch out of focus but so is a little bit of the blanket in the foreground. Same settings, totally different effect.